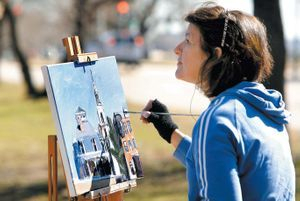 As a plein air artist living in South Boston, I find a limitless source for my paintings. Sunny days and moonlit nights find me painting on neighborhood street corners. When painting outdoors is not possible, I work in my studio on larger scale paintings and works derived from old family photos, portraits or from small studies and photos of my on-site locations. What interests me most about plein air painting is how sunlight breaks up form when it falls on an object. When working in this manner time is of the essence. I must return to the outdoor location at the same time, each day for the short period of time when the sun and shadows are at the same angle and position. I like to view the city as an urban canyon where shadows caused by the surrounding buildings create an unexpected pattern of dark and light. My choice of subject matter, such as old buildings, antique cars and nightscapes pay homage to a disappearing landscape. With my portraits and old photograph derived works I am hoping to also portray an intimate moment in time. I hope that with these paintings I am able to celebrate these people and these landmarks. Deb is a graduate of Mass College of Art with a BFA in painting. Born in New Hampshire, she has called South Boston her home for the past 30+ years. 2017 BNN Studio, Boston MA Portrait - and the story behind it!" 2009,2008,2007, 2006, 2005 Quincy Arts Festival, Quincy, Ma. 2016 1st place Quincy Arts Fest "Rainy Day"
• 2012 Second Prize and Honorable Mention, Massasoit Arts Festival, Canton, Ma "The Gathering" and “Self Portrait (When can I go out to paint?)" • 2012 Best in Show, SAA Juried Exhibition, Front Street Gallery, painting "In the Land of Giants"
• 2011 Best in Show, Massasoit Art Festival, Canton, Ma, painting "Alida's Vision"
• 2010 First Prize, Quincy Arts Festival, Quincy Ma, painting "Cale"
• 2010 First Prize, Massasoit Art Festival, Canton, Ma, painting "Fred"
• 2009 First Prize Painting, Quincy Arts Festival, Quincy, Ma, painting "Muls"
• 2009 Third Prize Painting, Arts Affair, Marina Bay, Quincy, Ma painting "Gate C"
• 2009 City's Choice Award, Downtown Crossing Juried Art Competition, Boston, Ma painting "Mul's"
• 2009 Third Prize, The Winter Juried Show, Art Complex Museum, Duxbury, Ma painting "Fred"
• 2008 First Prize, Quincy Arts Festival, Quincy, Ma painting "Nightguard"
• 2008 Best in Show, Arts Affair, Marina Bay, Quincy, Ma, painting "Garden of Earthly Delights"
• 2007 Honorable Mention, Arts Affair, Marina Bay, Quincy, Ma, painting "I Got It"